Well, so much for my good intentions to do some more blogging this year. Turns out, I spent most of my time these past months reading, mostly in the context of course work, so any thinking and writing I've done has been for course papers. Writing anything worth reading actually takes a large chunk of time, and I find it hard to write "off the cuff", which seems to be more common for blogs posts. Maybe now that I've got the course work over with ... . In the meantime, I'm on holiday visiting family, and I've got a new camera. The plan is to learn how to use different apertures, focal lengths, etc. and experiment with depth of field, freeze shots, etc.. And enjoy the food and family. 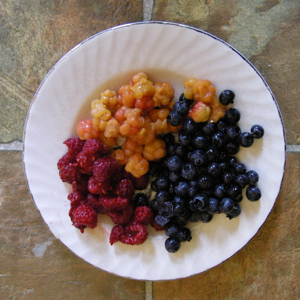 Here's a plate of wild berries - blue berries, raspberries and bakeapples (= cloudberries). More later, if I don't get lazy.